Seasonally removable docks are ideal for areas with high wind exposure and fast moving ice. Steel docks are replacing the crib style dock traditionally seen along Canada’s shorelines. Often these crib docks are in some stage of shifting, lifting or sinking. The supporting cribwork sits on the lake bottom and is continuously settling, creating the sloping twisted docks across our shores. Canada’s winter season is also quite unforgiving to crib docks and often they need re-levelling or replacement to stay straight. We’d like to make your retreat a place to enjoy, not a summer project each year. Our permanent docks have a solid foundation; we drive steel pilings down through the sand, silt & clay until we hit bedrock. 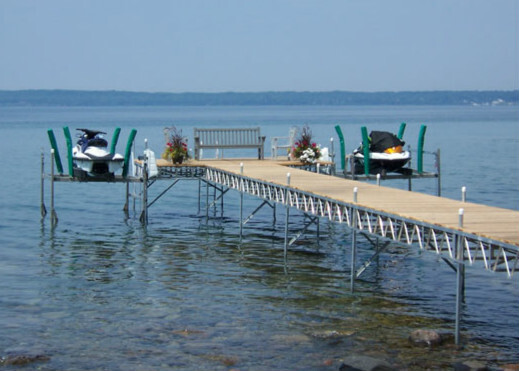 The structural integrity of the dock, a steel framework fabricated by our CWB certified staff, is welded to the pilings and our skilled carpenters finish the dock in the decking of your choice. Decking Options include a wood finish, cedar or pressure treated, composite decking, moistureshield or trex, and an Azek PVC decking option. Our new showroom houses samples of each decking option for your ideal finish.